The Holidays would not be complete for us without LEGOS. My son has been obsessed since he was a baby. One of the best days of his life was when a LEGO Store opened close by. His creations never cease to amaze me. I immediately got him to work on the computer! He had the best time, setting the scene and dressing up our family. It is the perfect hoiday activity and the results make everyone smile. He didn't stop there he also created them for extended family and friends. There are so many fun options in clothes, expressions and backgrounds. So get building your own LEGO Minifigure Family scene and send it to everyone on your list..
and you won't need any stamps, envelopes or trips to the Post Office! 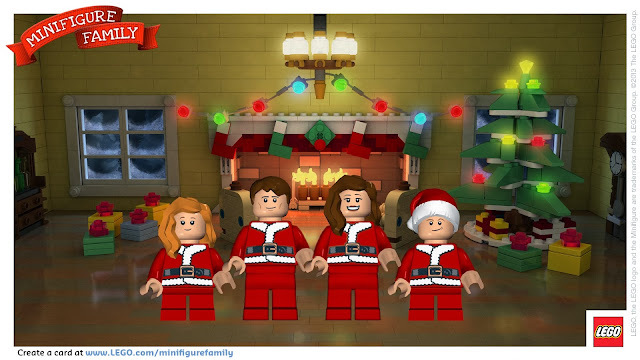 Happy Holidays, from our LEGO house to yours. I keep thinking my kid will outgrow LEGOs. Not the case. Last week he told me that he wants to become a LEGO designer and live in Europe. Let's hope he changes his mind!